Who’s ready for the 2016 Masters?! If you’re lucky enough to experience the Masters Golf Tournament in person, than that’s one thing to cross off the ol’ bucket list. If it’s still on the list, don’t worry, Shonal’s Kitchen has it covered, for all you fans watching at home! Not only is the game an experience, but the food is an experience! Its classic, it’s southern and it’s downright delicious. I’ve never been one to stick to a recipe (not even my own! ), so I’ve taken some of the simple classics that you would find at the actual Masters in Augusta, and put just a little Shonals spin on them. Impress your friends and host a Masters at home party. Whip up a few of these amazing recipes and they’ll be at your door every night! First rule of the party host thumb: Keep your guests hydrated and happy. Every party should have a good cocktail, this one is no exception. 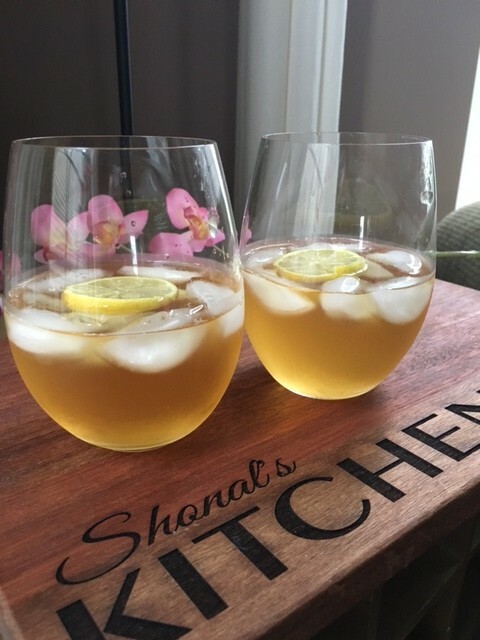 I thought it was fitting to honor the great Arnold Palmer and spice his famous drink up a little with this Boozy Arnold Palmer cocktail. It’s light and refreshing and will make you very happy! If you can’t find limoncello, which is an Italian liqueur, you can always make a fresh squeezed lemonade and use vodka. I thought the limoncello was kind of genius though…. Stir together ice tea and limoncello. Pour over ice and garnish glass with lemon slice. Next up, we need appetizers! 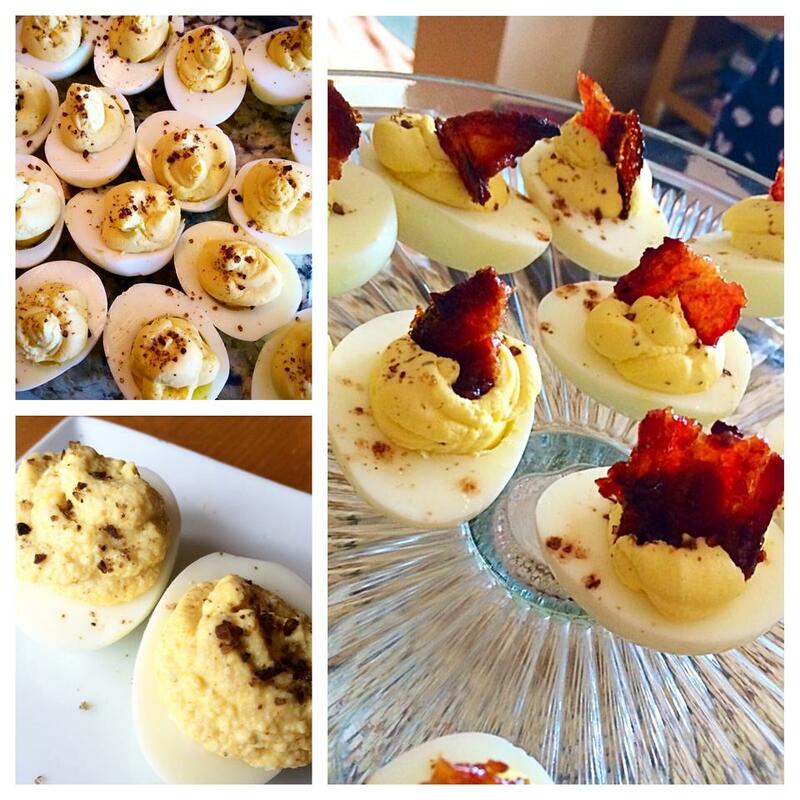 Some good ol’ Deviled Eggs are perfect. I absolutely LOVE deviled eggs and could probably devour this whole recipe on my own, so I recommend at least doubling it! The crispy, spicy bacon chip is what separates these from the ordinary. Let’s face it, bacon on anything, takes it to another level! Preheat oven to 400 degrees. Place bacon on rack over baking sheet. Sprinkle lightly with cayenne pepper and bake until crispy, about 12-15 minutes. Once cooled, break into bite size chips and set aside. Place eggs in a single layer in a saucepan; add water to cover eggs. Bring to a boil; cover, remove from heat, and let stand 15 minutes. Drain immediately and fill the saucepan with cold water and ice. Tap each egg firmly on the counter and peel under cold running water. Using a clean knife each time, slice eggs in half lengthwise, and carefully remove yolks. Mash yolks with mayonnaise. Add relish, mustard, and House Blend until creamy and well combined. Using a pastry bag (or zip lock bag with end cut off), pipe yolk mixture into egg whites. Garnish each egg with a crispy spicy bacon chip. Pimento Cheese is a southern staple, the simpler, the better. I couldn’t help myself, I had to put a little spin on it with some cayenne pepper for some heat and a little bit of SplenDishes Bourbon Bacon Salt. Yeah BACON SALT. Say. No. More. And just eat. 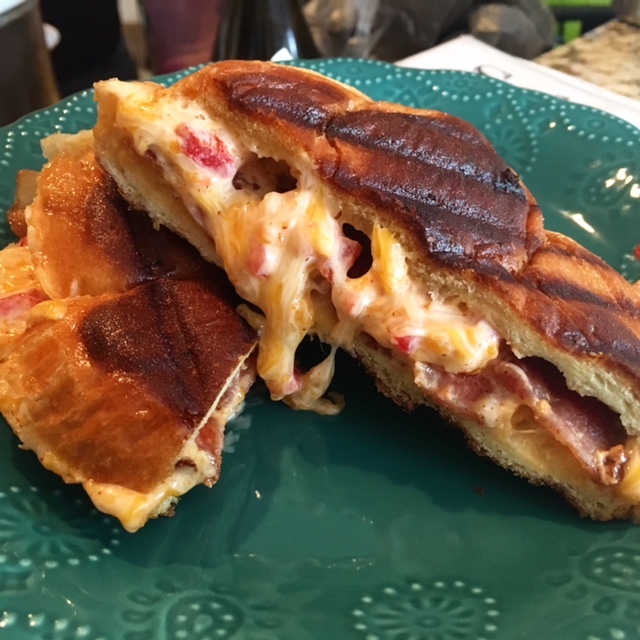 To Make Pimento Cheese: Combine both cheeses, mayo, pimentos, cayenne pepper and Bourbon Bacon Salt. Add additional cayenne if you like it hot! Keep covered and refrigerated for up to 2 weeks. Makes about 2 cups. Heat grill pan on medium high heat. Assemble sandwiches with pimento cheese and cooked bacon slices, then brush outer sides of sandwiches with reserved bacon grease (you can also use butter if you prefer). Place in hot grill pan until golden brown, about 4 minutes on each side. Slice in quarters and serve. Now that you have experienced what cheese heaven looks like, let’s check out Fried Chicken heaven. Seriously, I make some dang good fried chicken! Actually, I’m kind of known for my fried chicken and not being from the south (originally), I take that as quite the compliment. And now that I do live in the south, I can keep up with the best of them. 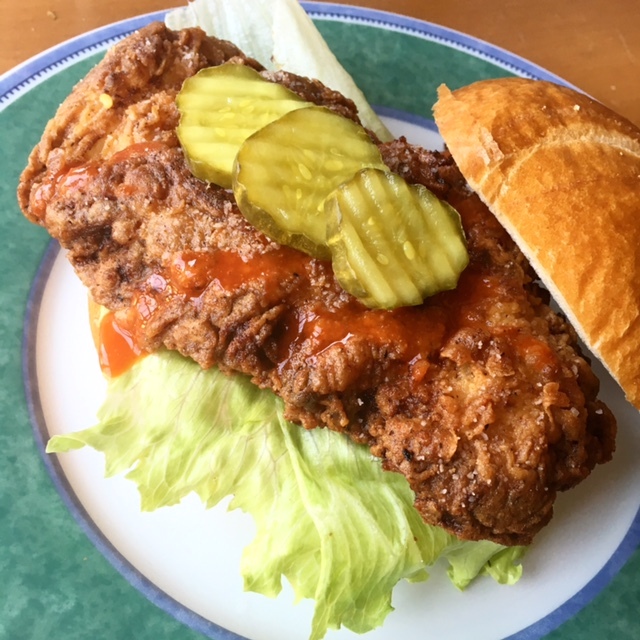 I’m pretty sure this was the best fried chicken sandwich I have ever had, but I guess I’m biased. Check it out for yourself. 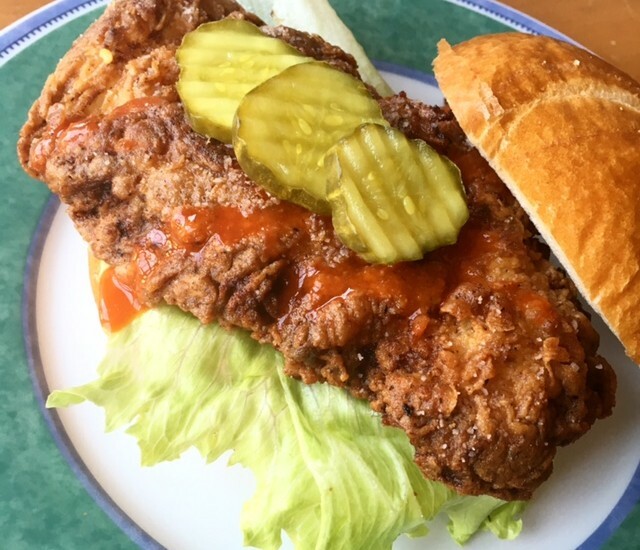 But really, how can you go wrong with hot crispy, tender, juicy chicken, spicy mayo, crunchy lettuce, salty dill pickles and extra hot sauce?? Did I mention it has Bourbon Bacon Salt?! To Marinate Chicken: Combine buttermilk, sriracha and chicken in zip lock bag and marinate overnight (or at least 4 hours). Be sure to take out of refrigerator 30 minutes before ready to fry. Prep Flour Mixture: In a shallow bowl, combine flour, House Blend and cayenne pepper. Taste and add additional seasoning, if needed. Cover and set aside until ready. Spicy Mayo: Combine mayo, sriracha and lemon juice. Keep refrigerated until ready to use. Heat canola oil in deep fry pan on high heat until it reaches 350 degrees. Dredge chicken in flour mixture, shaking off excess flour and gently place into oil. Fry until golden brown, about 8 minutes on each side. Remove from oil and place on paper towels and season immediately with Bourbon Bacon Salt. To Assemble Sandwiches: Slice Kaiser rolls in half and spread with spicy mayo. Place crispy lettuce on bottom bun, then top with chicken. Drizzle hot sauce over chicken and add pickles before topping with bun. Do you still have room in that belly of yours? Maybe you need to sit and chill for a few holes while the food coma you have induced upon yourself, wears off…. When you’re ready, I have a little dessert for you. You have to have a little something sweet to finish off this unbelievable dining experience. Fold chopped peaches into softened ice cream and chill. 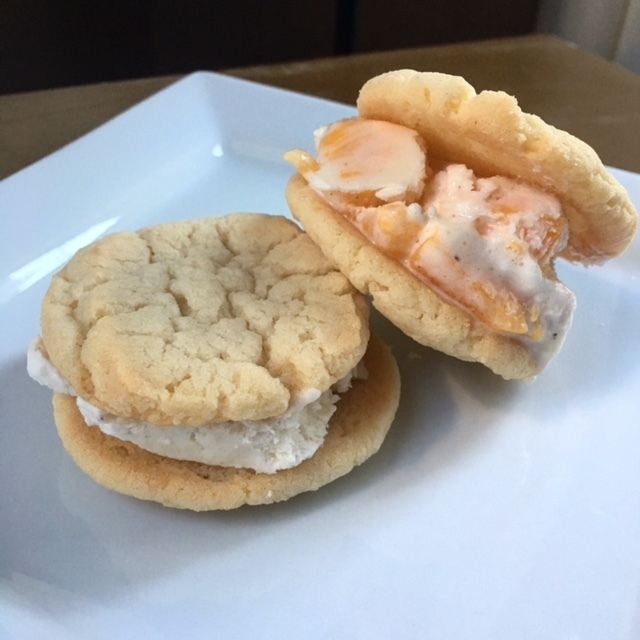 Spoon chilled ice cream in between 2 sugar cookies, wrap individually and keep in freezer. Well that about wraps up our little Masters party, what do you think? Until the next event, remember, Life is all about good food, good friends and good wine! Shonali Thomas lives in Charlotte, North Carolina with her husband, Eric and 4 year old daughter, Shaiyla. Her love of food and cooking began in her “mud kitchen” as a child and has flourished into the kitchens of many home cooks around the country. She published her first cookbook, “Shonal’s Kitchen;, The Eclectic Home Chef” in November, 2007 and in 2009, she began SplenDishes by Shonali and began selling her gourmet foods at local farmers markets, gourmet grocery stores and through her online store. SplenDishes Gourmet Foods, LLC has continued to flourish with its recipe blog and facebook page and continues to bring a new legion of fellow foodies who follow from and order her creations from all around the globe. Top grilling recipes that will make your 4th of July party pop!